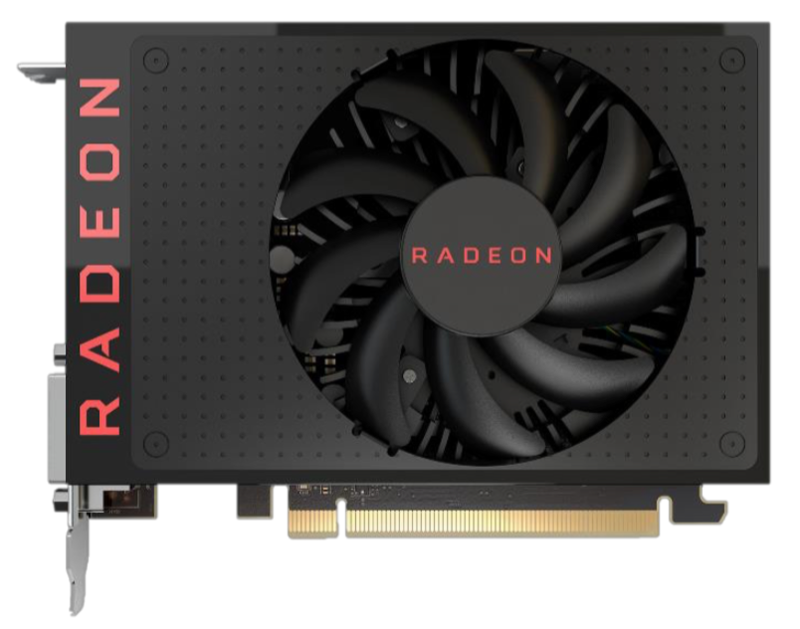 The AMD Radeon RX 460 is an entry-level gaming graphics card for desktop PCs. It was announced it August 2016 and is based on the smaller Polaris 11 chip (123 mm²), which is manufactured in a 14 nm FinFET process. The GPUs RX 470 and RX 480 on the other hand are based on the bigger Polaris 10 chip (232 mm²). The RX 460 uses 14 out of 16 Compute Units, all 16 ROPs, 56 TMUs, four 32-bit memory controller and 1 MB L2-cache. AMD specifies the clock with 1080 (base) up to 1200 MHz (Boost), but custom cards can have slightly higher clocks (like our test card from XFX at 1220 MHz). Contrary to Polaris 10, Polaris 11 supports Power Gating between the individual Compute Units. This will result in a lower consumption with partial workloads in particular. Depending on the memory equipment (2 or 4 GB GDDR5), the gaming performance of the RX 460 can differ quite a bit. Memory intensive games like Doom, Black Ops 3 or Mirror's Edge clearly suffer from just 2 GB. The 4 GB model is slightly faster than the mobile GeForce GTX 965M (refresh) as well as the desktop MSI Radeon R7 370 in our tests. This means the card is best suited for modern games in Full-HD at high details. The RX 460 is particularly convincing in DirectX 12 and Vulkan games. Polaris 11 is up to date in terms of features. It supports DirectX 12, Vulkan, DisplayPort 1.3 HBR (1.4 Ready), HDMI 2.0, FreeSync, HDR, and H.265 de- and encoding. Thanks to the 14 nm FinFET process, the power consumption was significantly reduced compared to a similarly fast R7 370. The RX 460 is also much more frugal compared to the RX 470 and 480 and only needs a bit more power than the expensive GTX 1070 Founders Edition while idling. It is also much more frugal than the old R7 370 and roughly on par with the Maxwell chips (GTX 950 - 960) under load.